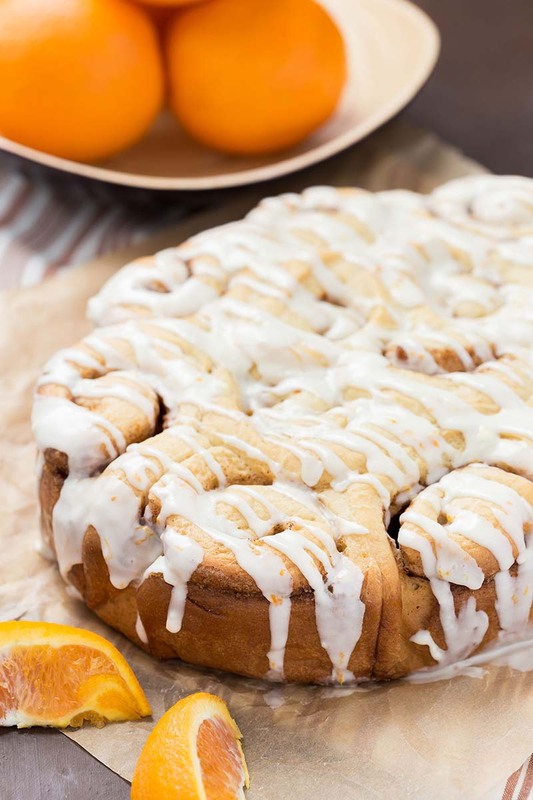 These are the best orange sweet rolls – soft, light, fluffy, with a hint of cinnamon orange flavor. Topped with a bold orange glaze, they’re completely irresistible. The dough is simple and doesn’t require time for rising because it all happens in the slow cooker. This is the easiest and most delicious sweet roll recipe ever! Line a 6-quart* slow cooker with parchment paper and spray the paper lightly with nonstick cooking spray. Make the dough: Heat milk and 1 tsp of the sugar in a small saucepan until it reaches 110-115°F. Remove from heat and stir in the yeast. Set aside for 5 minutes, until yeast has dissolved and the mixture begins to foam. In the bowl of a stand mixer fitted with the dough hook attachment, stir together 2 cups of the flour, salt, and remaining sugar. Add the yeast mixture, ¼ cup of the butter, egg, and vanilla. Mix on low speed until combined. With the mixer on low speed, add the remaining flour, ¼ cup at a time, until a soft dough forms. You may not need all the flour. The dough will be ready when it no longer sticks to the sides of the mixing bowl. It should feel soft but not sticky. Turn the dough out onto a lightly floured surface and let rest for 10 minutes. Make the filling: In a small bowl, combine the brown sugar, orange zest, and cinnamon. Roll the dough out into an 8x13-inch rectangle. Gently brush the remaining butter over the dough and sprinkle the filling evenly over the butter. Starting with the long side, tightly roll the dough into a log and pinch the seam to seal. Place the roll, seam side down, on a cutting board. Cute the dough into 10 to 12 equal pieces and arrange them inside the prepared slow cooker. Place a double layer of paper towel under the lid to prevent condensation from dripping onto the rolls. Turn the slow cooker on high and cook for 2 hours or until the rolls are cooked through. Remove the rolls buy lifting them out with the parchment paper. Make the glaze: In a small bowl, combine the confectioners' sugar, orange zest, orange juice, and heavy cream. Drizzle the glaze over the rolls while they are still warm and serve right away. *A 5-quart slow cooker will also work for this recipe. Use a 6qt slow cooker. A 5 qt one will work as well.